I had a dream that a lady came into my house uninvited. She didn’t force her way in either, but went straight into my living room—my favorite living room, and asked me if my chair really belonged there. Then she walked out of my house and left. “Watch out!” Jesus warned them. “Beware of the yeast of the Pharisees and Sadducees” (Matthew 16:6, NLT). If we go back to the Garden of Eden, we see the same strategy used on Eve to get her to the point where she questioned what God really said. That’s how the enemy works—under the radar. The same strategy of the enemy can be used in this day, at this time, and in this place. We’re usually on the lookout for affairs or people that are sneaking drugs, but the devil is too clever for all of that. He is masquerading himself (2 Corinthians 11:14). When I woke up from my dream, I went into my husband’s study and got out the Bible dictionary and looked up the word yeast. It’s cyme, which means to heat, to stir up, to excite unrest, to agitate, and to create discontent. It’s used figuratively to represent evil and malice. Leaven, from a yeast plant, is used in secret. It will disturb your peace from feeling content or satisfied. It’s like coming into contact with something or someone that causes you to no longer be satisfied. Leaven is very influential working to infiltrate the whole thing until it’s affected. Leaven has an unbelievable capacity for propagating itself. Leaven multiples with extraordinary rapidity under the right conditions, under favorable circumstances, and given the right set of circumstances this thing is on its way. Leaven is like last week’s dough affecting a new batch. It works unseen, but in the end if produces considerable effects. It will act, grow, and push through. That is the nature of yeast. Leaven in a community of faith is like an undisciplined brother or sister that tries to break up the spirit of unity. Gluten is what holds the dough together. To break up the church—all you need is to discredit or demean what God is doing, to find fault with others, to enforce your opinions with a critical or cynical spirit. To place a question mark where there should be an explanation point. That is how to break up the bond of unity. That is how to act like wolves in sheep’s clothing. “Beware of false prophets who come disguised as harmless sheep but are really vicious wolves” (Matthew 7:15, NLT). Do you know that if somebody is practicing sedition—it’s under the radar? According to the dictionary, wolves have perfect vision, a keen sense of smell, and fine hearing. They are strategic predators. They hunt any time day or night. They are quick and tireless. They’re clever. When the wind is blowing one way, they go against the wind to hide their real scent. Wolves never come up to you and say what they mean. But wolves are wrapped up in falseness and pretense. They profess simplicity and gentleness, but they’re foaming inside the mouth. They cause dissension, division, and malice. “I know that false teachers, like vicious wolves, will come in among you after I leave, not sparing the flock. Even some men from your own group will rise up and distort the truth in order to draw a following” (Acts 20:29-30, NLT). And now I make one more appeal, my dear brothers and sisters. Watch out for people who cause divisions and upset people’s faith by teaching things contrary to what you have been taught. Stay away from them. Such people are not serving Christ our Lord; they are serving their own personal interests. By smooth talk and glowing words they deceive innocent people (Romans 16:17-18, NLT). “But I am not surprised! Even Satan disguises himself as an angel of light” (2 Corinthians 11:14, NLT). Yeast is a bacteria. 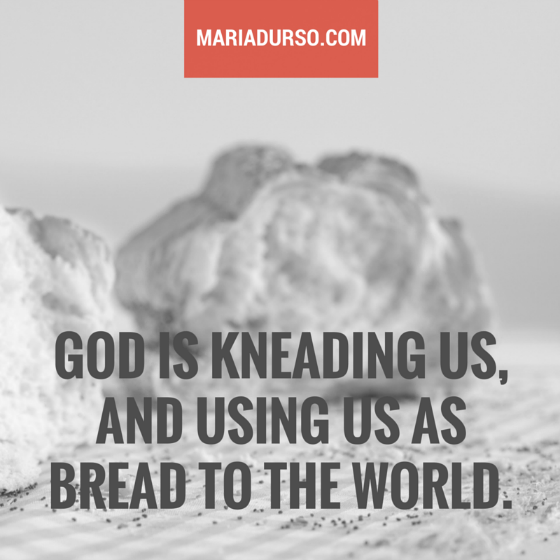 If the church is a mass of dough, God is kneading us, and using us as bread to the world. Yeast hides in the dough and affects it all. Yeast reproduces rapidly. As long as it has something living to attach itself to, it reproduces by a process called budding. Sin is like that too. Sin doesn’t only affect one person and we are all susceptible. Did you know that when yeast mixes with dough and there is no salt—it becomes unruly? It leaves the dough with bubbles. It has no strength. No body. The yeast eats through the dough, creating deep holes on the inside. When there is no salt, the yeast develops too fast. It’s puffed up but there’s no substance on the inside. Without salt, the yeast is allowed to go unchecked. Fire is the only thing that can destroy yeast. Yeast grows in darkness. It has to attach itself to something living in order to reproduce. Yeast feeds on sugar. Sugar makes it grow but salt keeps it in check. A wolf will surely find you. He’ll catch you and he’ll infect you with an STD, a satanically transmitted disease. In order to get rid of this yeast in your system, you got to eliminate all forms of sugar. Cut it off. Cut it out. God’s Word is salt. It’s not sugar. The church is salt. It’s not sugar. We are the salt of the earth. We are not the sugar of the earth. Salt is a silent working force which preserves us from corruption. Salt is an antiseptic. It stops rot and decay. Salt purifies us through and through. That’s why we have to remain salty. Cover not uncover. In every part of our hearts, we must not have any holes so the yeast of unrest and discomfort will not fall on us, making our thoughts uncontrollable. Do you ever hear that saying, it’s like they were pouring salt on the wound? If we’re offended today, if we’re saltless today—then for Christ’s sake—pour salt on the wound. The church is sick, and if we are to remain well in Jesus’ name, we need Him to salt us up. To fire us up. We don’t want to be contaminated any longer. How wonderful and pleasant it is when brothers live together in harmony! For harmony is as precious as the anointing oil that was poured over Aaron’s head, that ran down his beard and onto the border of his robe. Harmony is as refreshing as the dew from Mount Hermon that falls on the mountains of Zion. And there the Lord has pronounced his blessing, even life everlasting (Psalm 133:1-3, NLT). Question: Is there a fungus among us? Among you?